Obama Gives His Final Speech Before U.N. General Assembly : The Two-Way In his final speech before the U.N. General Assembly, President Obama called for a "course-correction" in the fight against extremism and for greater attention to climate change. 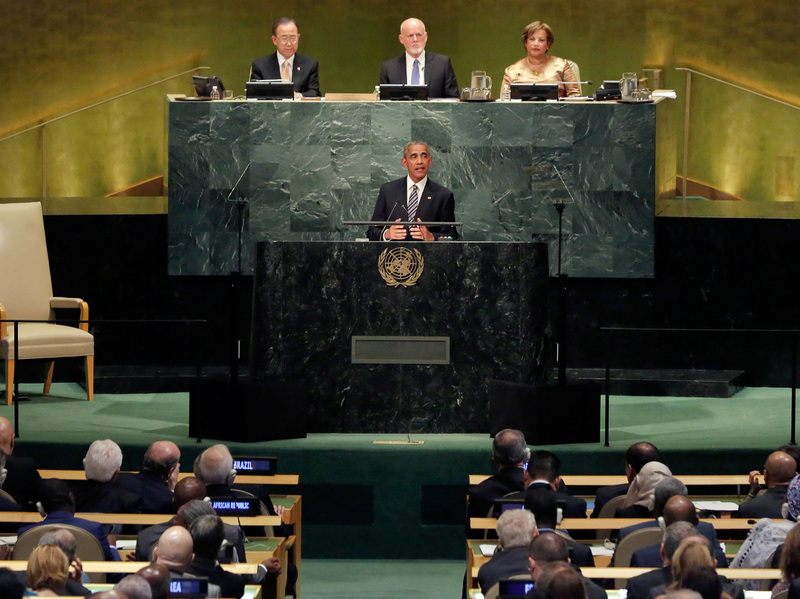 President Obama addresses the United Nations General Assembly in New York on Tuesday. President Obama addressed the United Nations General Assembly this morning, his final speech before the international governing body. As he nears the end of his two terms in office, the president spoke about some of his administration's biggest foreign policy initiatives, including the importance of the Paris climate accord, the nuclear deal with Iran and fighting the Ebola epidemic in West Africa. He also talked about the ongoing, multisided war in Syria. His speech comes the day after a cease-fire brokered by the United States and Russia collapsed, in part because of distrust sowed by an accidental strike by a U.S-led coalition aircraft that killed Syrian soldiers over the weekend. And on Monday, an aid convoy in Syria was attacked from the air. A Year After Iran Nuclear Deal, What Has Changed? Despite the ongoing violence, Obama defended elements of his administration's approach to the war in Syria, echoing points made by the United States' ambassador to the U.N., Samantha Power, who told NPR on Monday that the administration is pursuing the dual motives of "targeting terrorists and making sure that the starving and surrendering techniques end." He defended his overall approach to foreign policy, which has been characterized by high regard for diplomacy. Earlier in the day, U.N. Secretary General Ban Ki-moon also addressed the war in Syria in a speech to the assembly, saying, "There is no military solution." Ban's term as U.N. leader ends this year, and he said that while the body has "achieved much," he has deep concerns. "Gulfs of mistrust divide citizens from their leaders. Extremists push people into camps of 'us' and 'them,' " Ban said. "The Earth assails us with rising seas, record heat and extreme storms. And danger defines the days of many." We live-blogged as President Obama spoke. Scroll down and read "up" if you want to see how his address went. Update at 11:22 a.m. ET. "Futures are bound with the fates of other human beings"
As he closes, the president quotes Martin Luther King Jr., saying he believes that people around the world should strive to be "co-workers with God," in the pursuit of peace and prosperity. "I see that spirit in our young people around the world," he says. The next generation is "more educated and more tolerant and more inclusive and more diverse than our generation. They are more empathetic and compassionate toward their fellow human beings." The president says he thinks the U.N. should reflect the "irreducible truth" that doing what is "best for all people" is also the best way to ensure a better future for the people of any one country. Update at 11:13 a.m. ET. "We must pursue a world without nuclear weapons"
President Obama says the nuclear agreement with Iran is part of a larger fight to rid the world of nuclear weapons, and that nuclear tests by North Korea are worrisome. "Sometimes I am criticized at home for my belief in international norms," he says, explaining that his belief in diplomacy is not always popular. However, Obama defends his record of foreign policy over his two terms as president. "I believe we have been a force for good," he says of the United States. "We must reject any forms of fundamentalism or racism," President Obama says, as he turns to the importance of embracing tolerance. He warns against leaders who seek legitimacy "not because of policies or programs, but by resorting to demonizing other religious sects," referencing the Middle East specifically. "If our religion leads us to persecute those of another faith," he says, or to jail gay people or undercut the rights of women and girls, then we lose our power as an international community. The president also calls on world leaders to implement the Paris climate agreement, saying a focus on combating climate change is "not only the right thing to do, it's the smart thing to do," and that if climate change continues unabated, it will, among other things, fuel "conflicts born of despair." Obama then references the fight against ISIS, calling the group a "mindless medieval menace." "There is a military component" to fighting the group, he says, but "in a place like Syria, there is no ultimate military victory to be won," and diplomacy is a key tool for peace. Update at 10:55 a.m. ET. "I believe in a liberal political order"
President Obama turns to his broad beliefs on governance. He says liberal democracy is worth fighting for despite the fact that "building accountable institutions is hard work." Top-down leadership and governance by strongmen, he says, will ultimately lead to instability and war. "Because of our ideals, ordinary people were able to organize and march and protest," he says of the United States. Freedom "turned our diversity into a strength. "I do not think this story is unique to America," Obama says. "The countries that have succeeded are the ones in which people feel they have a stake," he says, going on to reference the uprising in Ukraine as evidence for the power of citizen engagement. "The cure for what ails our democracies is greater engagement, not less," he says. He also argues that trade agreements such as the Trans-Pacific Partnership are important tools for lifting people out of poverty, but that rich countries must do more to help the poor around the world. Update at 10:45 a.m. ET. "A course-correction"
The president says that in order to move forward, "we do have to acknowledge that the existing path to global integration requires a course-correction." Free markets and global trade have created gaps between rich and poor. "Too often those trumpeting globalization have ignored inequality," he says. However, he also warns against those governments that would deny globalization or try to isolate themselves, calling it "self-defeating." "Today, a nation ringed by walls would only imprison itself," he says. Update at 10:38 a.m. ET. "The paradox that defines our world today"
As he begins, President Obama says the world is both more prosperous and less violent than it was at the end of the Cold War, and yet it is more uncertain and filled with strife. "We must go forward and not backward," he says. "Those who deny others dignity are subject to public reproach." The president is running late. To keep the agenda running, the president of Chad, Idriss Déby, is asked to speak before, instead of after, President Obama.